17 years of US private company engagement in exploring the oil potential of Western Sahara has come to an end. The US oil company Kosmos Energy has left Western Sahara. This marks the end of 17 years of large multinational companies in the oil sector in the occupied territory. The withdrawal was announced on the website of the Moroccan national oil company ONHYM yesterday, 6 February 2018 [or download]. There are no references to the news on the website of the two companies. The companies held licence on the Boujdour Maritime offshore block. The announcement came only weeks after it was known that Glencore has terminated the operations offshore the same territory. Only three minor oil companies are now engaged under Moroccan petroleum exploration contracts in Western Sahara: San Leon Energy (UK/Ireland) onshore, New Age (Jersey) and Teredo Oil (UK) offshore. Western Sahara Resource Watch has been in contact with Kosmos Energy for the last decade over the matter. Several international investors proceeded to blacklist the Kosmos and Cairn from its portfolios due to beach of ethical standards. Among them were one of Kosmos' largest shareholders, the sovereign wealth fund of Norway in 2016. On 19 December 2014 , the American oil company Kosmos Energy began to drill for oil in occupied Western Sahara, through an illegal deal with the occupying regime, Morocco. "The company is adding fuel to the fire", stated WSRW. "The Council recommends the exclusion (of Cairn and Kosmos)... due to an unacceptable risk of the companies contributing to serious violations of fundamental ethical norms through their hydrocarbon exploration offshore Western Sahara," the ethical council of the large investor said. "The Council is of the view that no distinction can be made between exploration and exploitation activities in this context," the council said, adding that it "has not been satisfied that the operations take place in accordance with the wishes and interests of the local people". Read the October 2014 WSRW report 'Platform for Conflict' about Kosmos Energy's oil drilling. The involvement US private exploration companies began in 2001, as ONHYM (then 'ONAREP') signed an agreement with Kerr-McGee. Based on that contract, the UN Security Council asked its Legal Counsel for an opinion of such involvement. The Counsel responded in January 2002 that any further oil exploration in Western Sahara would be illegal if it was in the disregard of the wishes of the people of the territory. Yet, without obtaining consent from the people of Western Sahara, Kerr-McGee proceeded with two rounds of seismic studies. In 2006, after large US and international pressure, it departed the territory, leaving their minority partner Kosmos Energy to take over the operatorship. Kosmos had entered with a minor interest in 2004. The director of a handicap institution in Western Sahara was attacked by police as he went out to the street with this poster. Since then, Kosmos has carried out several rounds of seismic studies - the latest in 2017. Kosmos and Cairn did the first drilling offshore the territory under 40 years of foreign occupation in 2014 to 2015. The drilling did not provide the results it hoped. The two companies have throughout claimed that oil exploration is legal as it is to the "benefit of the population" of Western Sahara. Kosmos even constructed an entire website www.westernsaharaoil.com. The propaganda site misreads the conclusion of the UN Legal Opinion from 2002, which had stated that the legality of such operations are to be in accordane with the "wishes and interests of the people of the territory". 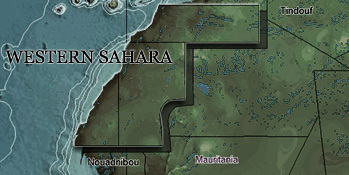 In other words, Kosmos fails to take into account the wishes of the Saharawis, and replaces the people of the territory with the "population". The Court of Justice of the EU on 21 December 2016 argued (paragraph 106) that the argumentation of benefits is irrelevant. Based on judgment, the people of Western Sahara succeeded in the detention of vessels taking part in the plunder. The statement from ONHYM on 06 February 2018 explains that "Kosmos Energy opens the possibilities for discussions with ONHYM for a possible return for the petroleum exploration in Morocco". From ONHYM's perspective, that would include Western Sahara. The text explains that Kosmos Energy's departure from the licence is to focus on its other assets in West Africa. There is no explanation of Cairns's motives to exit. "We welcome the decision of the two companies. They had no right to enter into exploration agreements with the Moroccan government for the territory of Western Sahara. Based on Kosmos's and Cairn's lack of interest in taking into account the wishes of the Western Sahara, and considering their apparent lack of sufficient human rights policies, we expect shareholders to maintain their exclusion of the two companies until they issue a guarantee that they will not return to Western Sahara and they have the right policies in place", Erik Hagen of Western Sahara Resource Watch stated. "We call on the three international companies still active in oil industry in the occupied territory to immediately withdraw", Emhamed Khadad, member of the Polisario leadership stated to WSRW. More recently, the Norwegian Support Committee for Western Sahara on 17 January 2018 asked the assistance of the OECD national contact point in the United States for its help stopping Kosmos Energy from misrepresenting an OECD mediated statement in Norway from 2013. 29 October 2004. Kosmos Energy partners with Kerr-McGee for the ‘Boujdour block’, with a 30% share. 7 November 2005. Kosmos Energy first states that it plans to drill off the coast of Western Sahara. 2006. Kerr-McGee leaves Western Sahara. Kosmos Energy signs an agreement for the operatorship of the ‘Boujdour block’. 2009. Kosmos Energy commissions 2D seismic services from the Dutch company Fugro NV. Saharawis demonstrate. Fugro later announces it "has decided to abstain from any further involvement in Western Sahara until the political situation has been resolved". July 2013. BGP Prospector carried out seismic studies. wholly-owned subsidiary of Cairn Energy PLC to partner on the Boujdour project. Kosmos announces that it has identified three prospects, the largest of these, called Gargaa, at 2135 meters depth. The name of the block is changed to ‘Cap Boujdour Offshore’. February 2014. A Kosmos company presentation states that the drilling ship Atwood Achiever will be used in Boujdour exploration-license area. March 2014. Aker Solutions AS, which had been responsible for building and installing the drilling system on the Atwood Achiever, states that “if we had known that the equipment would be used in Western Sahara, we would not have signed this agreement”. The company cancelled the maintenance agreement it had with the drillship. May 2014. BGP Prospector carried out a 3D study on the same block. Dec 2014-Feb 2015. The drillship Atwood Achiever carries out drilling for Kosmos on the block. June 2016. One of Kosmos Energy's biggest owners, Norway's sovereign wealth fund, divests from Kosmos for operating in breach of fundamental ethical norms. March 2017. Kosmos commissions yet another seismic study employing the BGP Prospector. October 2017. Kosmos possibly with another round of seismic studies. 6 February 2018. ONHYM announces Kosmos' departure.